AVC/H.264 Video ES Viewer Pro solution provides a structural representation of AVC/H.264 video elementary stream compliant with the ISO/IEC 14496-10 specification. The application allows the user to investigate the video sequence parameter set, picture parameter set with their extensions and inner structures. Supported are AVC/H.264 video elementary streams with, which have NAL unit separation with start code prefixes as per Annex B in the AVC specification. 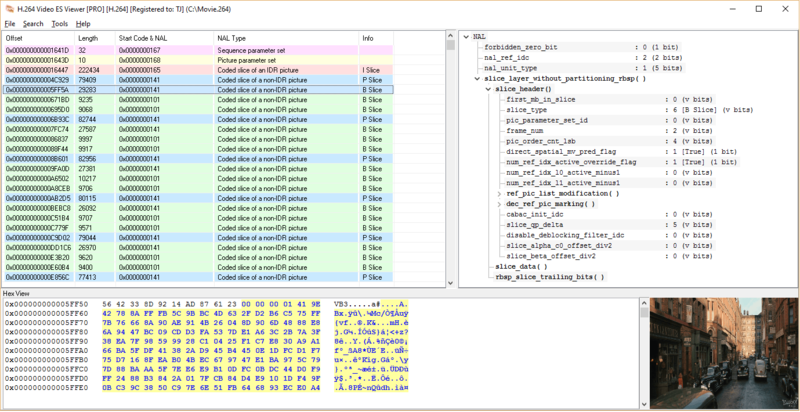 The solution supports basic HEX data editing of Access Units. AVC/H.264 Video ES Viewer Pro also supports some video elementary stream manipulations, such as SEI messages removal, AUD removal and non-IDR slices removal. The Pro version also additionally supports more H.264 structures, such as Slice Header, SEI Messages, SPS Extensions and other structures in accordance to the ISO/IEC 14496-10 and the ITU-T H.264 recommendations. Apart from the manual AVC/H.264 video stream validation provided in the AVC/H.264 Video ES Viewer Pro solution, Jongbel Media Solutions also provides automated AVC/H.264 video validation in its Media Validator solution. Not sure how AVC/H.264 Video ES Viewer Pro will work for you? Stream Frame Graph represents the frame position, type, size and offset information about the frames in the loaded AVC/H.264 video elementary stream. The currently loaded file in AVC/H.264 Video ES Viewer Pro can be validated by selecting “Validation” from the “Tools” menu. Each H.264 check can be disabled or enabled or set to another report type, such as Info, Warning or Error. The solution can be applied in wide variety of workflows and with many container format deviations due to its flexibility and customization ability. AVC/H.264 video elementary stream import from MXF container. 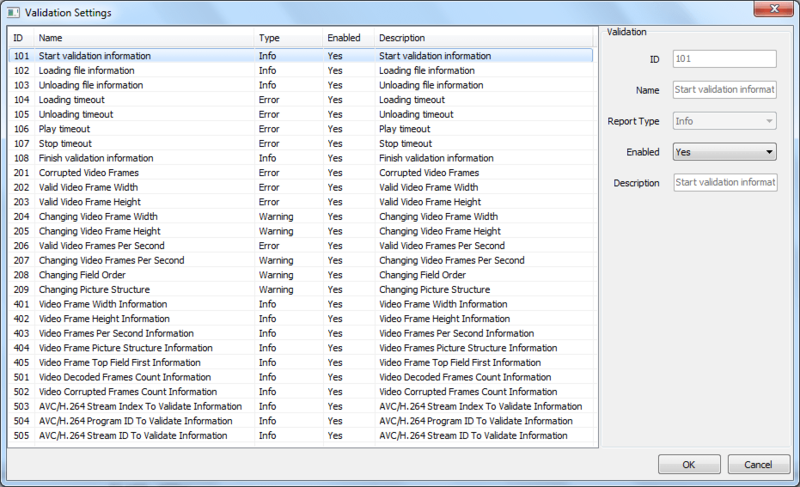 For detailed validation check list follow the AVC/H.264 Video ES Viewer documentation.